[CONT](VC/RC):During your turn, if a new card was put into your damage zone this turn, all of the units in your front row get [Power]+3000. [ACT](Damage zone):If your opponent’s vanguard is grade 3 or greater, and this card is face up, COST [put the top card of your deck into your damage zone face down], and ride this card as [Stand]. 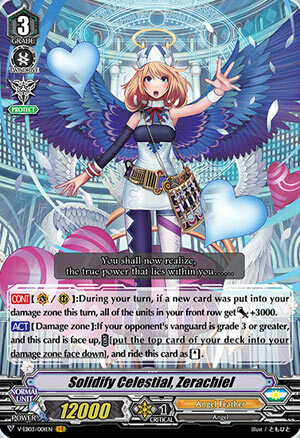 Sadly her first skill is not stackable, only granting 3k once if you loaded a card to the damage zone this turn. This will help push the 9k attackers to 12k so they can hit non-Force VGs alone but all things considered you’re still not in a great place if you rid this first. Obviously also there to get out of any Zanbaku shenanigans the opponent decides to pull on you with her second skill but really it’s kind of situational. if nothing else at least it gives Metatron something to ride on top of to proc her skills in full. For Metatron’s sake only if nothing else she’s going to be run. Whether it’s 2 or 4 depends on how much you value Mobile Hospital Feather Palace at. I’d say quite a bit since otherwise you are screwed for finishers in AF, so at least you shouldn’t need to shell out too much for this.